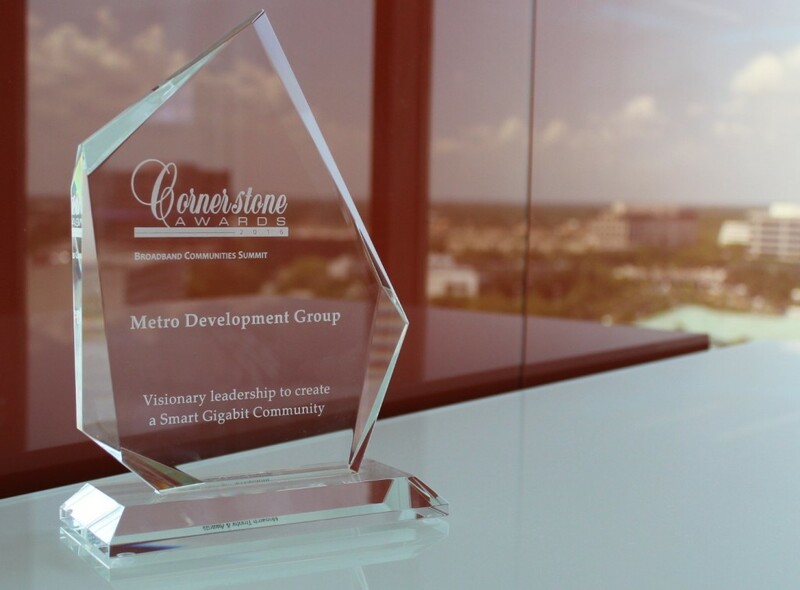 Metro Development Group recentlyreceived a Cornerstone Award from Broadband Communities Magazine for its vision of broadband technology as the key to the sustainable communities of tomorrow. Broadband Communities is the leading source of information on digital and broadband technologies for buildings and communities. Metro was recognized for its plans to create and implement a “Connected-City Corridor” in Pasco County, Fla. – the nation’s first planned “Smart Gigabit Community” to be built from the ground up with a fiber network providing Gigabit internet access. To develop the community, Metro is partnering with Pasco County and was also recently recognized by US Ignite, a non-profit organization that fosters the creation of next-generation internet applications in communities across the country. The 7,800-acre “Connected-City Corridor” is expected to attract tech-savvy businesses, retailers and residents to an area built around Gigabit-enabled applications and services that promise to deliver new advances in education, healthcare, public safety, energy, and transportation. Metro Development Group is also building two Crystal Lagoons in the “Connected-City Corridor” that will be multiple acres in size and provide a unique amenity to the residents. The first Crystal Lagoons to be built in the U.S., they will offer crystal clear waters and will be large enough to use a kayak, canoe or small sailboat. The annual Cornerstone Awards are given to industry leaders with outstanding accomplishments in broadband technologies and telecommunications. Winners are selected by a distinguished committee of analysts, editors, writers and other industry leaders. The award is given to a select few developments, municipalities, communities and individuals each year. This year’s awards were presented at the 2016 Broadband Communities Summit in Austin, Texas, on April 6.